THE PSNI is under mounting pressure to suspend its use of stop and search powers granted under Section 44 of the British government’s Terrorism Act 2000. The European Court of Human Rights (ECHR) ruled on 12 January that the power to stop and search people arbitrarily – without any grounds for suspicion – was a violation of the human right “to respect for private life”. The British government has refused to repeal or suspend the legislation and has said it plans to appeal against the ruling. 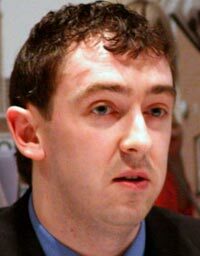 Sinn Féin MLA and member of the Policing Board Daithí McKay said the most recent figures available from the PSNI on the powers backed up the ECHR’s ruling’s finding that the so-called anti-terror legislation was being abused by police, and used in an arbitrary and discriminatory way. While in Britain the powers have been used disproportionately against black and Asian people – who are four times more likely to be stopped under S44 – McKay said the nationalist population in the Six Counties was overwhelmingly bearing the brunt of this violation of civil rights. “Sinn Féin has campaigned against this abuse of power by the police since the introduction of this draconian legislation by the British government. We believe that, in light of the European Court of Human Rights ruling that the Section 44 powers are illegal, the PSNI must now suspend its use of these powers,” McKay said. There was a dramatic jump in their usage, with figures more than doubling from the previous quarter. From July to September last year, 10,265 people were stopped and searched under S44 in the Six Counties. Stop and search powers continue to be invoked a vastly disproportionate number of times in nationalist areas. The constituency with the highest number of people stopped and searched during the July-September quarter was Foyle, with 2,203. While S44 stop and search powers were used 1,305 times in Strabane during the quarter, they were used only once in Larne, a town of around equal population. The use of stop and search continues to be demonstrably ineffective by the PSNI’s own criteria. Of the more than 10,000 people stopped and searched during the quarter, only 39 were subsequently arrested. Section 44 of the Terrorism Act allows areas to be “designated” for the use of stop and search without suspicion by a police constable. The designation is made by an assistant chief constable and subsequently endorsed by the Secretary of State – and it can be made without going through any judicial or parliamentary process. Under the legislation, the designation lasts 28 days, but can be renewed on a rolling basis. Civil rights groups in England responded with outrage last year when it emerged that the whole of Greater London had secretly been an authorised stop and search area since 2001. The powers allow police to stop an individual or a vehicle within a designated area and search the person, anything they are carrying, and their vehicle. The legislation means that police officers no longer have to have “reasonable grounds of suspicion” to do so. In 2008/09 police forces in the North, and in England and Wales, stopped and searched around 250,000 people under S44. In 2008, the London Metropolitan police stopped and searched more than 2,000 children under 15 years old – including 58 under the age of nine. In July last year the London Metropolitan Police force announced it was refining and limiting its use of S44 powers following a review. The police force in Hampshire, England, said it was suspending its use of the powers the same month, citing the fact that no arrests were made despite more than 3,000 searches being carried out. The European Court of Human Rights case was brought against the British government by two people who were stopped, interrogated and searched under the legislation in London in 2003 as they made their way to an anti-war demonstration against an arms fair. English civil rights group Liberty strongly supported the case. The power to search a person’s clothing and belongings in public could cause humiliation and embarrassment and was a violation of Article 8 of the Convention on Human Rights which guarantees the right to respect for private life. The fact that the decision to stop and search somebody was “based exclusively on the ‘hunch’ or ‘professional intuition’ of the police officer” meant there was a “clear risk of arbitrariness in granting such broad discretion” to a police officer. The judges were concerned by the way the powers are authorised. There is no requirement that the powers be considered “necessary” – only “expedient”. The absence of any obligation on police officer to show a reasonable suspicion “made it almost impossible to prove that the power had been improperly exercised”. The court found that the use of stop and search, and the way the powers are authorised, are “not sufficiently circumscribed nor subject to adequate legal safeguards against abuse”. McKay said that the problems in the use of such police powers were compounded in the Six Counties, with a long history of such powers being abused for political repression against republicans and nationalists. “Many of those who have been stopped and harassed by the PSNI were stopped because of their political opinion or background. This abuse of power amounts to political policing and damages the credibility of police forces that use them as well as community relations,” he said. McKay said that Sinn Féin was calling on the PSNI to suspend its use of S44 powers and was challenging the PSNI on the issue on the Policing Board and in the District Policing Partnerships. Sinn Féin spokesperson on Policing and Justice and Policing Board member Alex Maskey has written to the British government and the PSNI chief constable asking for their response to the ECHR ruling. Fellow Policing Board member and Sinn Féin MLA Martina Anderson will be part of the Policing Board’s Human Rights and Professional Standards Committee’s review of stop and search powers which was announced following the ruling. “The PSNI should now suspend its use of Section 44 in light of these facts and the ruling from the European Court of Human Rights that it is incompatible with Convention rights. The continued use of this legislation is a flagrant abuse of human rights,” McKay said.